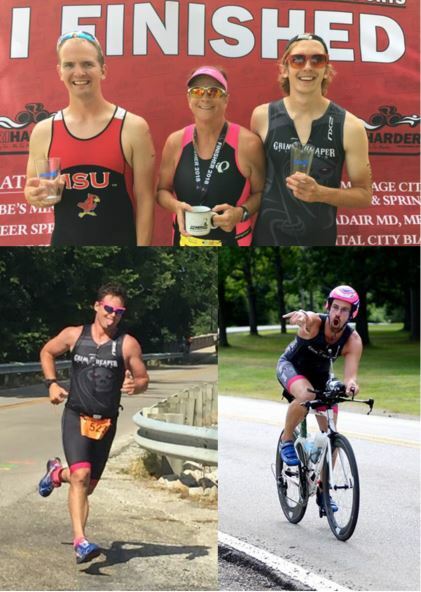 SPRINGFIELD – Michael and Chris Braun, Jason Sturdyvin, and Bryan Heppe led a big group of Reapers with top-10 overall finishes at Tri Harder Promotions biggest race day of the season Saturday. The Braun brothers finished 5th and 9th in the Stoneman Sprint Triathlon; Sturdyvin was 5th in the Iron Abe Olympic Tri; and Heppe was 7th in the Route 66 70.3 distance race. Nancy Braun, Tim Auth, and Julie Zei took 1st-place finishes in their age groups, while 10 others garnered top-3 finishes. Michael Braun took 5th overall and won the 20-24 age group in the Stoneman Sprint, which consisted of a 500-yard swim, 12-mile bike, and 3.1-mile run, with a time of 1:04:23. His run time of 20:03 was 2nd best on the day. Chris Braun took 2nd in 20-24 at 1:08:43. Isaac Goughnour was right behind, finishing 11th overall and 2nd in 15-19, with a time of 1:09:06. He posted the best swim leg of the day in the sprint, coming in at 6:54.12. 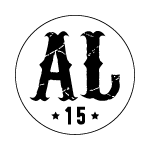 Top finishes on the women’s side included: Nancy Braun, 1st in 55-59 at 1:30:21; Ainsley Matthews, 2nd in 14-and-under at 1:25:03; Lily Matthews, 2nd in 15-19 at 1:37:54; Riley Cate, 3rd in 15-19 at 1:37:59; and Jori Cooper, 2nd in Athena at 1:30:37. The Matthews sisters posted two of the best women’s swim times on the day; Lily’s 7:26 was fastest, while Ainsley’s 8:04 was good for 4th. On the men’s side, Tim Auth and Wayne Ross finished 1st and 2nd, respectively, in the Clydesdale division at 1:11:32 and 1:22:02. Adam Pool was 2nd in 35-39 at 1:15:30. In the Iron Abe Olympic race, Sturdyvin finished at 2:16:17 to place 2nd in 35-39 and 5th overall. It was a strong, consistent performance for Sturdyvin who posted a 26:12 in the 1500-meter swim, 22.9 mph pace in the 25-mile bike, and a 7:01 pace in the 6.2-mile race. Zei, competing in her first Olympic-distance race won the 30-34 division in 3:16:19, while Jay McGee was 3rd in men’s 30-34 at 2:38:46. In the Route 66 race, Heppe finished in a strong time of 4:46:14 to win the 40-44 age group, while pacing 7th overall. Like Sturdyvin, he had a consistent overall race, posting a top-10 time in all three legs. He completed the swim in 30:47 (6th best), while posting a 22.1-mph average on the bike (9th best) and a 7:45 pace on the run (8th best). Christine Kachelmuss and Danielle Pfister each completed her first 70.3 race, with Kachlemuss taking 3rd in 30-34 at 6:18:54 and Pfister finishing at 7:47:12. Dan Thurston was 3rd in Clydesdale at 6:46:31.